You'll find Phuket weather averages on many websites - rainfall, temperature... and the data seems about right to me, but I never see any mention of where the data comes from, where it was measured exactly or what years it is based on. So I was happy to find a Danish guy living in Patong who has been measuring the rainfall since 1998. Every day. Thank you very much to Steen for sending me his data for the last 11 years. He says he's using a rain measuring gauge called Rain-o-Matic made by a company called Pronamic. 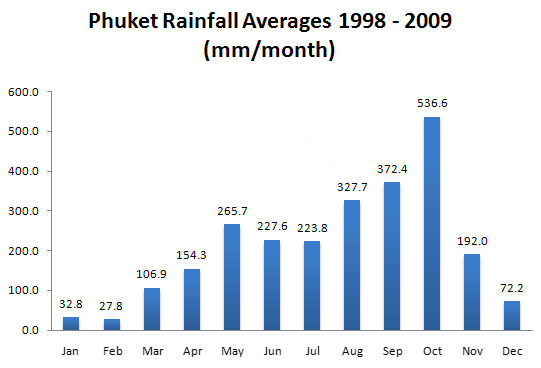 Now, of course there can be variation in rainfall around Phuket. Showers and thunderstorms can be very isolated. It can rain in Karon Beach, not in Patong. It can rain in Patong, but not 5km over the hill in Kathu where I live. BUT given 11 years worth of data, things should average out pretty well! What can we learn from this? Well, it does agree with most other averages I have seen. I am surprised to see October as the wettest month... but then again an average October can see some heavy rain early in the month, and then as the SW monsoon winds disappear you get some heavy thunderstorms later in the month which last only an hour but can be very heavy. There IS plenty of sun in October too, and later in the month the seas are often calm and the main diving season really gets going. Best months - well, sure December - February. The data from Steen shows 3 years (2002, 2005 and 2006) with no recorded rain in February. December varies from 2mm in 1999 up to 131mm in 2004. But on average these 3 months are the best for a hot sunny Phuket holiday. March gets a bit wetter, but can vary wildly - from 6mm in 2004 up to 249mm in 2001. Mostly this will be brief heavy thunderstorms, as March is a very hot month. You don't get much in the way of wind or bad weather. A one hour thunderstorm on a hot day can be a good thing! April is a very hot month and again gets thunderstorms, but the seasons can start to change in late April. May is the start of the "wet season" and you often get more rain, as is shown. But I think it is clear that June and July are not too bad for a summer holiday. This year has seen the driest June (50mm rain) since Steen started measuring data. Wettest was 2006 (over 400mm!). August looks surprisingly wet too, but again a lot of variance over the years ranging from just 89mm of rain in 2005 up to over 500mm in 2000. September I thought was the wettest month. I think compared to October, September is not as nice - you will still get wind and waves due to SW monsoon winds, which then die out in October. How many days does it rain? Well, how do you define a rainy day? I would say there are very few "rainy days" in Phuket at any time of year. I would call it a rainy day if the rain falls for long periods, skies are grey and the weather forces you to change your plans. The kind of day when you crack open a beer at the hotel bar at 10am and think glum thoughts. Well, the graph below shows the average number of days that recorded "some rain". Could be 2mm, could be 100mm in a day. As I say, many days have just short bursts of rain and are still what you'd call a "nice day"! Even taking into account what I just said about short bursts of rain and isolated thunderstorms, you can see that the "low season" summer months from May - August have totally dry days more than 50% of the time. I keep telling people that the summer is not a bad time to come! From December to March, very few rainy days. Again, plenty of yearly variance - the month of June 2009 saw only 7 days with any kind of rain, the same as in February 2006. 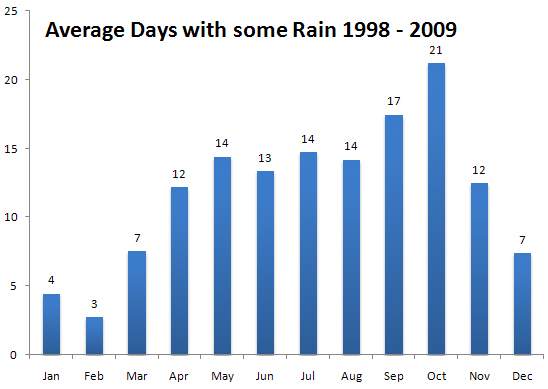 In 2008 there were only 120 days in the whole year with some rainfall, compared to a high of 171 days in 2000. Oh, the weather is such a fickle friend! You can come to Phuket in January and still get rained on. You can come in a "wet" month and have great weather. Following averages does not mean 100% that the weather will be better in March compared to July. A good chance, sure, but for example March this year saw over 180mm of rain.. in 2008 only 15mm was measured in March. So I say this... don't worry too much about the weather!